Growing with the Freshmushrooms Grow Kits is extremely easy. These kits are completely maintenance-free thanks to a fully colonised substrate without fillers. You hardly have to do anything to get your first flush with high levels of psilocin. Follow the steps below and you will be assured a rich harvest! Take the Grow Kit, plastic bag and paperclip out of the box. Remove the lid of the Grow Kit (store the lid properly). Rinse the lid under running water. You will need it again later. Place the grow kit without lid in the plastic (supplied) bag. Slide the opening of the bag under the bottom with the micro perforation pointing upwards. The opening of the bag is now largely closed. You do not have to worry about air circulation. From the moment you see the first small mushrooms (see photo), you can put the bag upright. Do not water. 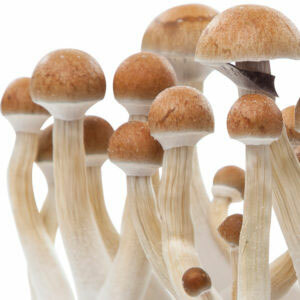 The first magic mushrooms will be visible after about 1 week. Place the Grow Kit in an area with enough daylight and at a temperature between 18 °C and 28 °C. NEVER place the grow kit in direct sunlight. Although mushrooms will grow at almost any temperature above 15 °C, 23 °C is the ideal temperature for an optimal harvest. 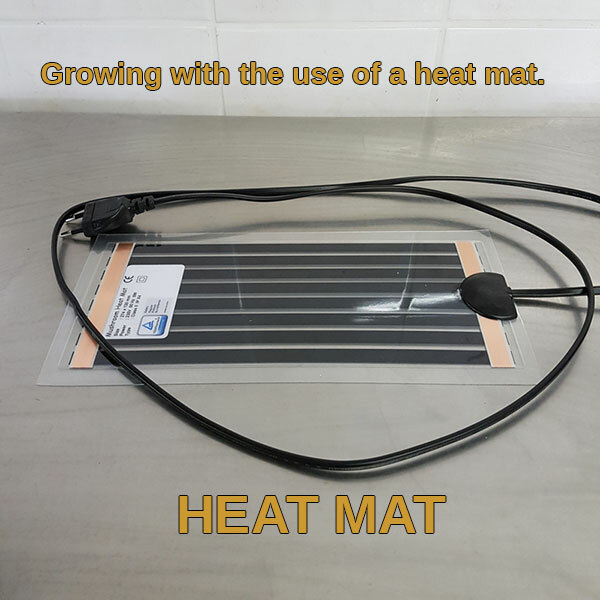 Special heat mats are available to ensure this temperature and not have to heat the entire room. In this phase (see photo), leave the bag slightly open, so that the moisture can evaporate a little. Too much moisture is not good. Your first harvest will be about a week after the appearance of the first pellets. Make sure you harvest before the first spores begin to fall! Freshmushrooms grow kits produce their first harvest fairly quickly. The first buds are already visible after only 1 week. Low and high temperatures may slightly delay this growth process. As soon as the first shrooms are visible it usually takes about one week before the mushrooms are fully developed. The moment of harvesting is extremely important. If the spores under the caps are still closed but threaten to burst or let go by the power of the caps, the time has come to harvest. These kits produce several mushroom harvests. To do so, fill the kit with clean tap water after the first harvest. This process is known as cold shock. It breathes new life into the mycelium and ensures that enough moisture is present for the mushrooms to grow. Place the lid of the Grow Kit back on the kit. Let the kit rest for 12 hours. Open a corner of the lid and drain the excess water. From here you can follow the instructions from step 1 again. This process can be repeated several times. 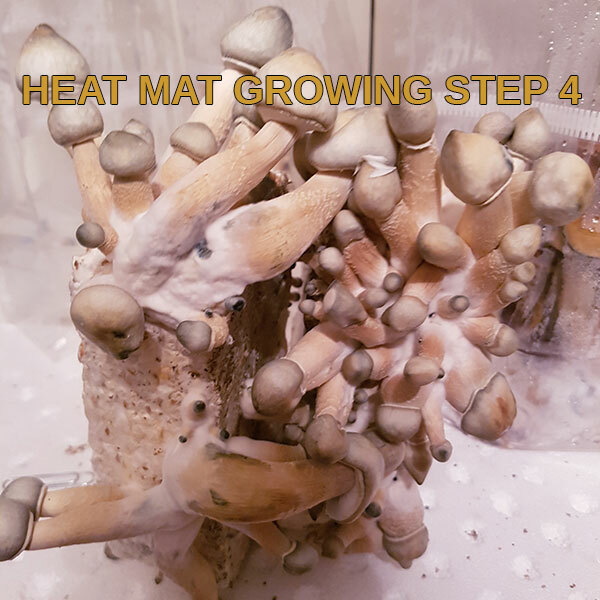 Growing with the use of a heat mat. 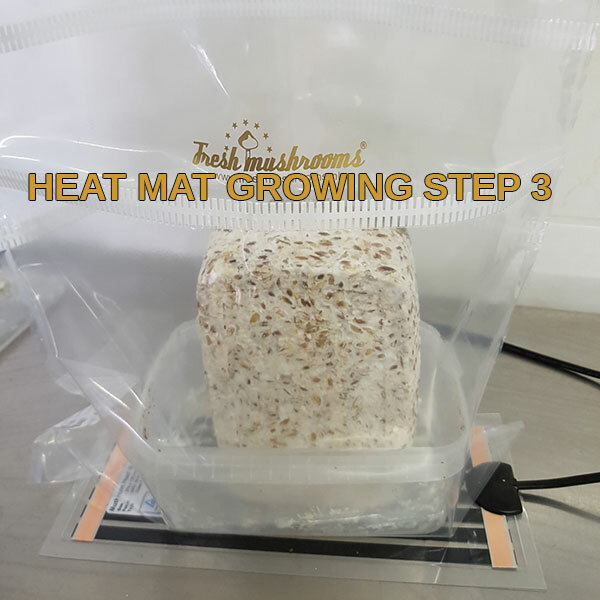 Place the plastic bag with the Grow Kit in it on the heat mat. Switch the heat mat on. 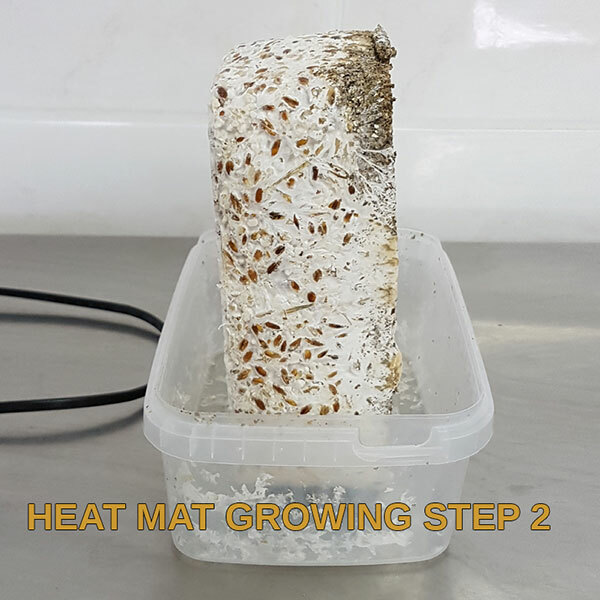 After two days switch the heat mat off and wait until the buds have developed, which usually takes between five and ten days. Then switch the heat mat on again and open the top of the bag a little so the moisture can evaporate. What to do if the buds haven’t developed after ten days. Take the cake out of the plastic box, put it back in the plastic box on its side and start again with two days with the heat mat switched on, then switched off.